stakes are now graded. The stakes duo joins the Grade 3, $600,000 Calumet Farm Kentucky Turf Cup at Kentucky Downs, which along with New York’s Belmont Park were the only tracks to gain more than one newly-graded stakes. Graded stakes are those judged the best in America by the Thoroughbred Owners & Breeders Association’s American Graded Stakes Committee. The Turf Sprint and Ladies Turf are among only eight in the United States and Canada that received new Grade 3 rankings for 2017. A record $8,404,000 will be offered in purses and Kentucky Thoroughbred Development Fund supplements at the meet, for an average exceeding $1.68 million a day — tops in the country. Even horses that aren’t registered Kentucky-breds will compete for some of the biggest pots in the country. The mushrooming of purses is fueled by what horsemen earn through historical horse racing, an innovative pari-mutuel technology that allows patrons to bet on previously-run races for a different type of wagering experience. “By working with our horsemen and embracing historical horse racing, Kentucky Downs is able to offer unprecedented purses. 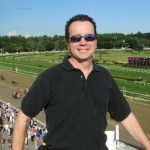 The owners and trainers have responded and now we’re getting over the hump to attract graded status for our stakes,” said Ted Nicholson, Kentucky Downs’ senior vice president and general manager. “Success will breed success, we believe exponentially. Additional graded stakes are so important, because that provides trainers from across the country more reasons to come for a short meet. And as they make plans for their Kentucky Downs’ contingent, we encourage them to put additional horses on the flight or van to go after our $130,000 maiden races, with allowance races $140,000 and $145,000 offered for Kentucky-breds, which comprise the vast majority of our horses. The 1 1/2-mile Calumet Farm Kentucky Turf Cup, for which Skychai Racing’s Da Big Hoss is the two-time defending champion, will be conducted on the same blockbuster card Saturday, Sept. 9, as the 6 1/2-furlong Turf Sprint, mile Ladies Turf and $350,000 Ladies Sprint at 6 1/2 furlongs. The Turf Sprint received a $50,000 purse hike over 2016. Kentucky Downs added a 3-year-old stakes: the $250,000 Franklin-Simpson to be held at seven-eighths of a mile on Thursday, Sept. 14, which is closing day. Two stakes have new names paying tribute to past winners. The $400,000 Tourist Mile, formerly the More Than Ready Mile, honors WinStar Farm’s winner of the 2016 Breeders’ Cup Mile, Eclipse Award finalist and current WinStar stallion. Tourist won the stakes now bearing his name in 2015 off a 10-month layoff. The 1 5/16-mile stakes for fillies and mares formerly known as the Kentucky Downs Ladies Marathon now is the $350,000 Ramsey Farm Stakes, recognizing the track and Kentucky’s all-time winningest owner in Ken and Sarah Ramsey’s Nicholasville farm. The Ramseys won the stakes last year with Al’s Gal, who in her next start captured Woodbine’s Grade 1 E.P. Taylor. The Ramsey Farm also is on the closing card. The Tourist Mile has been moved to Saturday, Sept. 2, which features a stakes quartet on the opening card. Also that day: The $350,000 Kentucky Downs Juvenile, $350,000 Exacta Systems Juvenile Fillies and $150,000 One Dreamer for fillies and mares. Kentucky Downs is staging two additional $75,000 starter-allowance races for a total of four on Sunday, Sept. 10 that will serve as automatic qualifying races for the Claiming Crown in December at Gulfstream. The Claiming Crown, which totaled $1.1 million in purses last year, serves as a Breeders’ Cup-style championship for claiming horses — the work horses of American racing. The new Claiming Crown Canterbury Stakes Prep at Kentucky Downs, at 6 1/2 furlongs, will be for 3-year-olds and older horses that have raced for a claiming price of $25,000 or less since Jan. 1, 2016. The Claiming Crown Distaff Dash Stakes Prep at Kentucky Downs is the filly and mare counterpart. Also back for the second year are the Claiming Crown Emerald Stakes Prep at Kentucky Downs and Claiming Crown Tiara Prep at Kentucky Downs, both a mile and 70 yards. Winners of the qualifying races are guaranteed a spot in the corresponding Claiming Crown race, with Kentucky Downs providing a shipping stipend of up to $1,000 and the $100 nomination fee. “We are putting out our stakes schedule and condition book 4 1/2 months in advance to give horsemen plenty of time to chart out their summer and fall schedule,” said racing secretary Tyler Picklesimer. “We constantly work to improve our entire racing program in order to attract horses and horsemen from across the country and even overseas. We also appreciate that our bread and butter is the Kentucky horsemen, who have consistently proven that their horses hold their own no matter who shows up. Saturday, Sept. 2 — $350,000 Exacta Systems Juvenile Fillies, 2yo fillies, 7 furlongs; $350,000 Kentucky Downs Juvenile, 2yos, 7 furlongs; $400,000 Tourist Mile, 3-year-olds & up, mile; $150,000 One Dreamer, fillies & mares 3 years old & up, mile and 70 yards. Thursday, Sept. 7 — $150,000 The Old Friends Stakes, 3-year-olds & up, mile and 70 yards. Saturday, Sept. 9 — $350,000 Kentucky Downs Ladies Turf (G3), fillies & mares 3 years old & up, mile; $400,000 Kentucky Downs Turf Sprint (G3), 3-year-olds & up, 6 1/2 furlongs; $600,000 Calumet Farm Kentucky Turf Cup (G3), 3-year-olds & up, 1 1/2 miles; $350,000 Kentucky Downs Ladies Sprint, fillies & mares 3 years old & up, 6 1/2 furlongs. Sunday, Sept. 10 — $350,000 Exacta Systems Dueling Grounds Derby, 3-year-olds, 1 5/16 miles; $200,000 Dueling Grounds Oaks, 3-year-old fillies, 1 5/16 miles. Sept. 14 — $350,000 Ramsey Farm, fillies & mares 3 years old & up, 1 5/16 miles; $250,000 Franklin-Simpson, 3-year-olds, 7 furlongs.